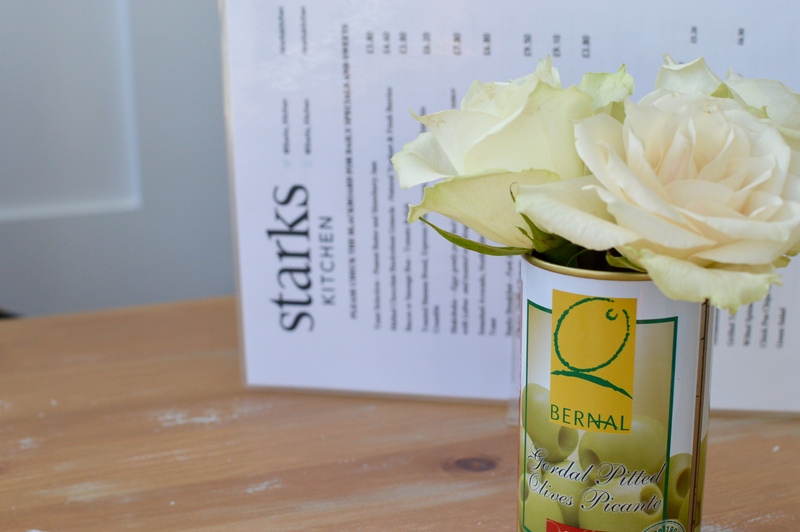 You can’t miss Starks Kitchen if you’re driving down Chillingham Road in Heaton. The bright white signage and (stark) white interior really stands out from the rest of the shop fronts. 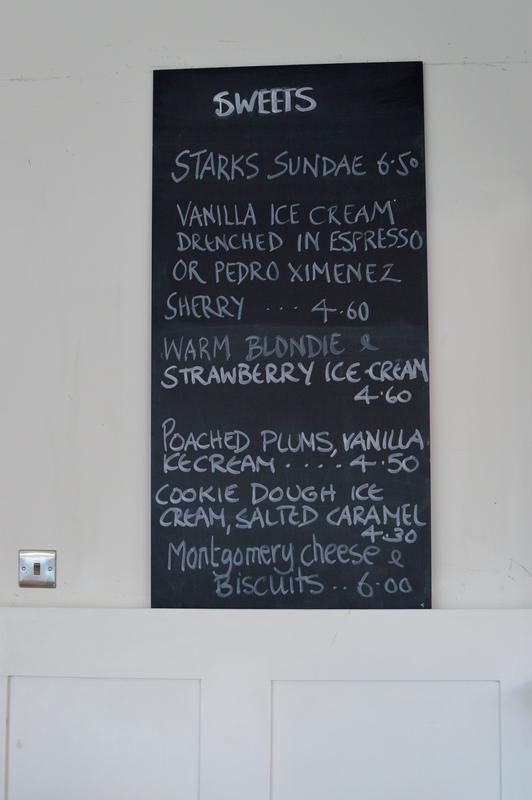 Starks Kitchen has opened up where Cal’s Own used to be (the best pizza in the toon has moved to Jesmond). It’s a family-run venture, with husband and wife duo at front of house, their son is one of the two chefs. I visited for brunch on Sunday, with a friend who’d been the weekend before and loved it so much she wanted to go back. It was a gorgeous sunny day in the toon, and I expected to have to wait, but we had our pick of tables and chose one by the window, with lots of natural light and a view of the Elvis statue thing outside Peggy Sue’s Diner next door. There were a few tables occupied already, and after having a quick peek around at the food, it looked great. After much deliberation on both of our parts, I decided to order from the brunch menu instead of from the Specials Board, you all know by now that breakfast is my favourite! 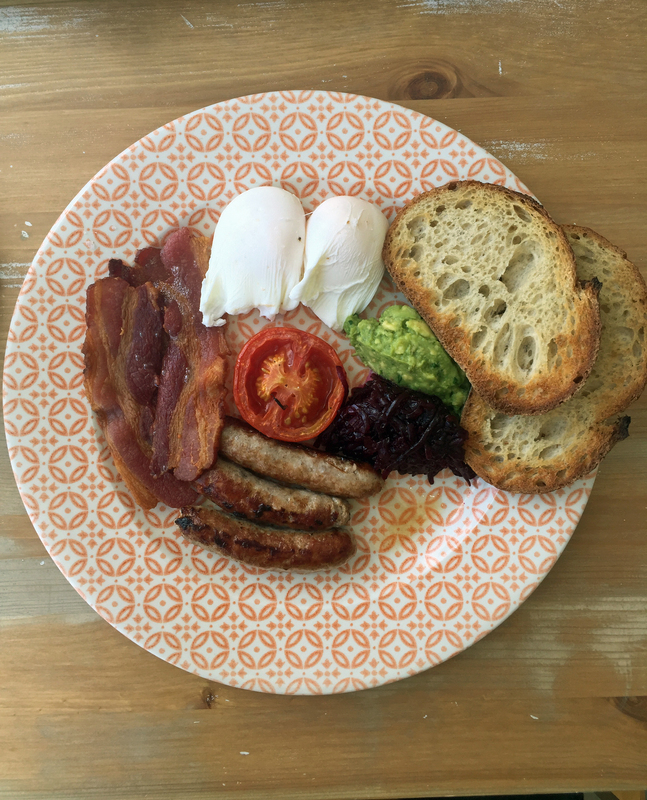 I went for the Starks Breakfast (pork bangers, smoked streaky bacon, 2 x eggs of your choice, grilled tomato, avocado, beetroot relish, sourdough toast – £9.50) and my friend chose something from the Sunday Special board, she got the Salt Beef Hash with Fried Duck Egg (£11.50). I opted for a cappuccino (£2.50) and my friend got a pot of tea (£2.50 I think) and freshly squeezed Grapefruit Juice (£3). My other choice would have been the Toasted Banana Bread (espresso mascarpone, berries and pistachio crumble) or the Shakshuka (eggs gently poached in spiced tomato and red pepper sauce with feta and toasted sourdough). It’s very rare that I’d choose a sweet breakfast option, over eggs & bacon, but I want to go back for the banana bread. I’ve seen a photo of it on Instagram and it’s so pretty. Our drinks arrived pretty quickly, and with a smile! My coffee was great, I had a quick taste of my friend’s grapefruit juice and loved it but despite leaving the tea for brew for ages, it still looked pretty weak when poured. It was loose leaf so maybe just needed half a teaspoon more. I was so ready for the Starks Breakfast by the time it arrived. It looked fantastic and I couldn’t wait to get stuck in. I asked for some butter to go on my sourdough, as none came with the breakfast but it was brought over straightaway, along with some salt and pepper. 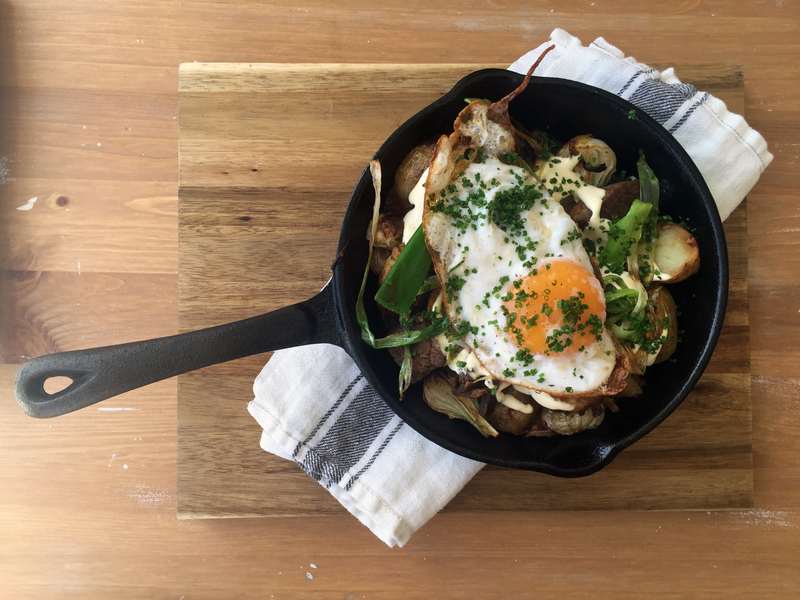 My friends Salt Beef Hash looked incredible and came served in a frying pan. Fancy. 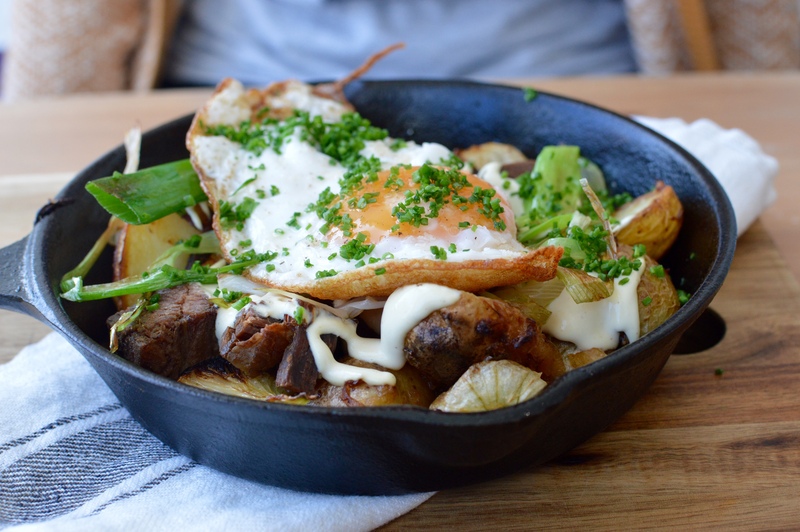 My friend really enjoyed the Salt Beef Hash, she was very happy with how much beef was in there and loved the horseradish sauce. 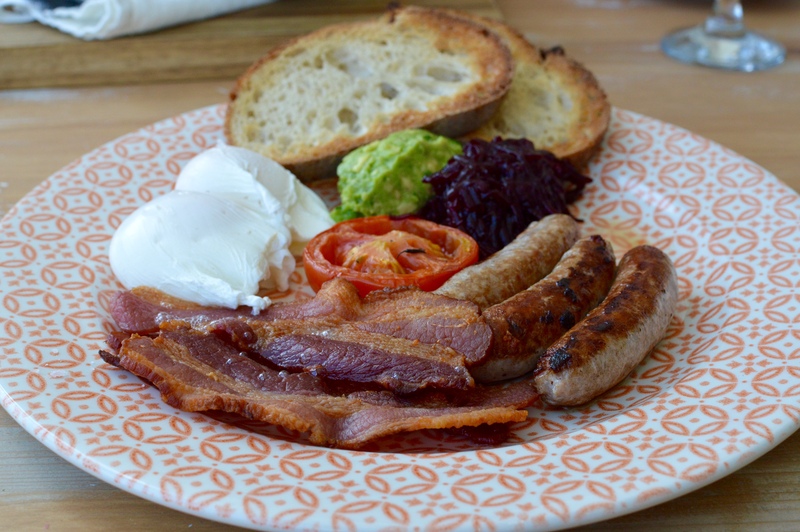 I loved my breakfast, the sausages were really good, bacon was crispy and cooked exactly how I like it and there was so much runny yolk from my poached eggs, I can’t fault anything! The standout part of this breakfast was the beetroot relish. The sweetness from the relish went particularly well with the salty smoked bacon. So happy I asked for some butter with my toast, what’s better than buttery sourdough dipped in hot runny yolk?! When my friend had the Starks Breakfast the weekend before, she paid a bit extra for some Hollandaise sauce to go alongside it, she loved it so much she considered getting the exact same thing again. I can imagine this combination would be delicious. 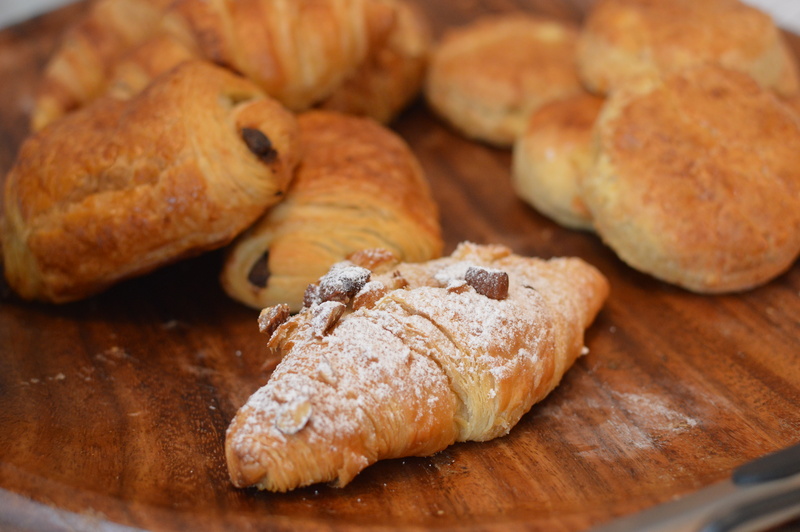 The place was pretty busy during our visit, but I managed to get a few pics as we were leaving… the pastries and cake at the counter did catch my eye. If I hadn’t had such a huge plate of food I would have considered something sweet from the board with another coffee, but I was so full! 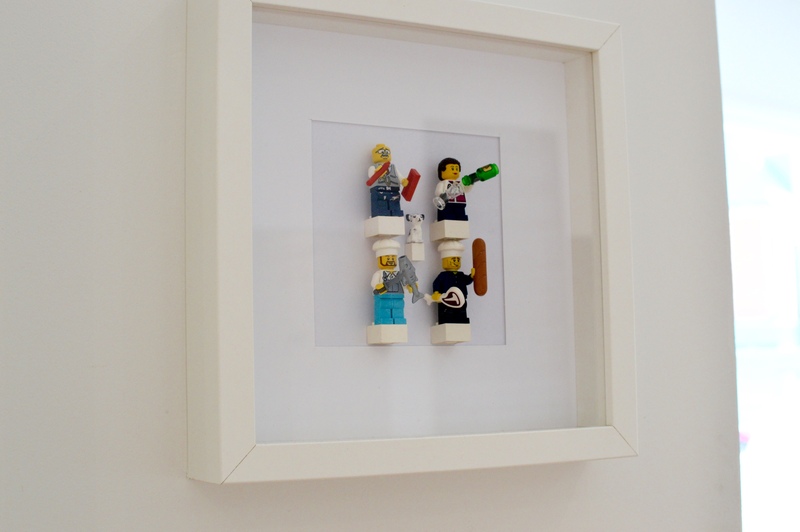 Almost missed this and actually went back to take a photo, here are the Starks Kitchen team, as tiny lego people! 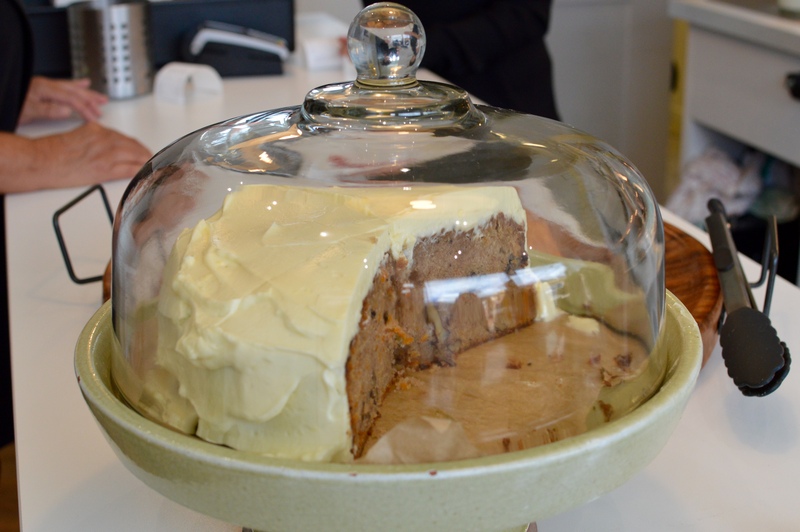 In their own words, Starks Kitchen is their take on a modern British cafe, I think they’re doing a great job – based on the food we ate and how the place looks and feels. It has a wonderfully calm ambience, and even though it’s not that big, you’re not sandwiched together with the nearby tables. It’s the kind of place you could go alone, armed with a book, and enjoy some good food and quiet time. A diner on a table near us was doing just that, when we arrived. 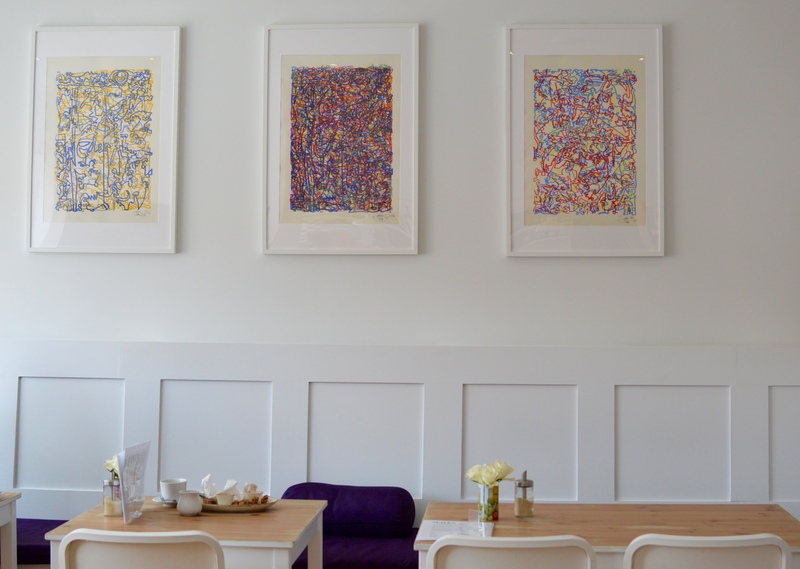 It’s a fab addition to Chillingham Road and I’m glad the gap left by Cal’s Own has been filled by somewhere like Starks – even though the food served is wildly different to Cal’s, they’re both passionate about serving good quality food. Where possible, they use ethically sourced, local produce with their meat coming from the wonderful Charlotte’s Butchery in Gosforth. The owners were lovely, they were chatty, smiley and friendly. I would be interested in going back to see how it fares in the evening, as they’re open for dinner Thursday, Friday and Saturday. Have you visited? 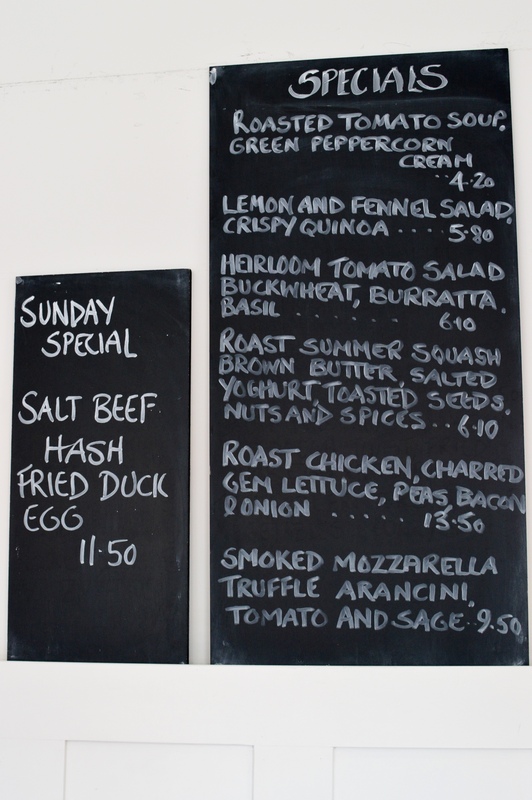 Would love to hear what your favourites are from the menu! 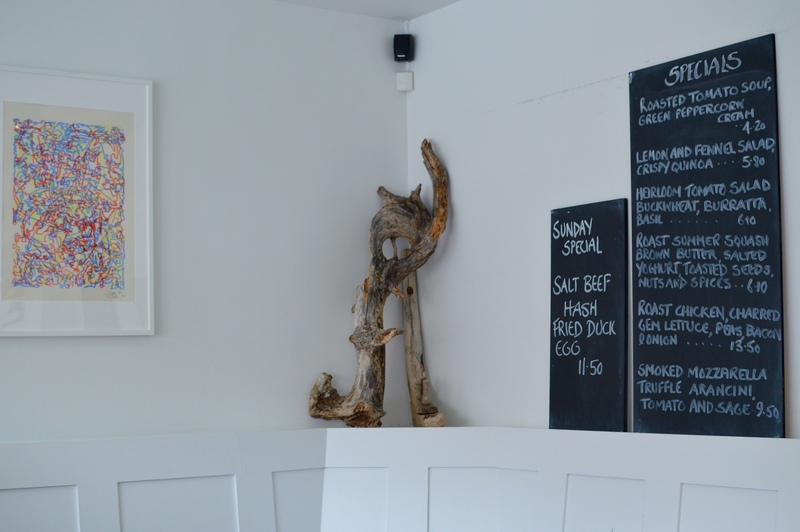 It sounds lovely – I think I’d struggle with what to order though as it all sounds delicious! I didn’t think it could look any fresher, it looked so bright and airy when I saw it! 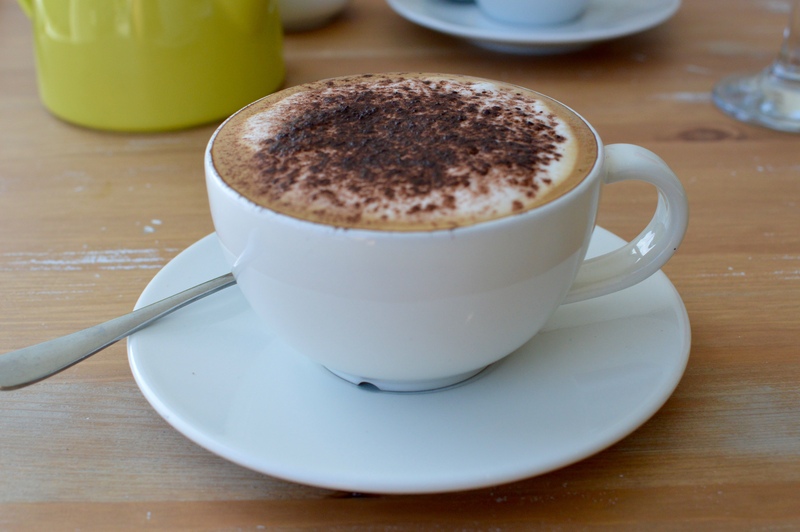 I live about a ten minute walk from chilli road but never actually think to use the cafes! Out of all of them I’d pick Starks though. been meaning to head here for a while – looks canny! You’ve made my mouth water! This is right up my street. I think I’d be hard pushed to choose too! Going to share this on my Facebook page as part of my north east Friday shares tomorrow afternoon.